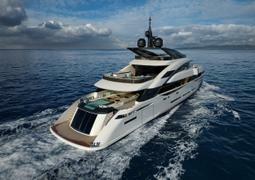 A new-build 45 metre motor yacht from ISA Yachts' Grand Turismo series has been sold. The GT 45 is already under construction at ISA’s Ancona shipyard and will be delivered to its owner in time for summer 2020. With exterior design by Enrico Gobbi and interior by Luca Dini, the GT 45 "represents a new era for the Gran Turismo line", the yard said. A steel hull and aluminium superstructure combines style and sportiness, and takes inspiration from modern sports cars. The exterior profile features pronounced external arches connecting the hull to the superstructure, enhanced by distinctive sports car-inspired features - namely the air intakes which are characteristic of ISA yachts. The volume of the superstructure is concentrated astern resulting in a slender silhouette with strong and flowing lines. The GT 45’s contemporary interior accommodates eight guests in four large cabins, including a luxurious full-beam master suite complete with a balcony and private access to the bow sunbathing area. 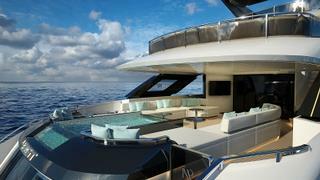 Meanwhile, large windows along the yacht’s profile provide the master cabin and main saloon with breathtaking views. The interior balances precious and natural materials as well as "high-tech" elements such as carbon, mainly used to make the bespoke furniture. The main deck aft is home to what the yard claims is the largest swimming pool ever seen on a yacht of this length, as well as a beach club/gym with sea level glass doors. The GT 45 accommodates a crew of up to seven and provides a range of 3,500 nautical miles at a speed of 12 knots. The new-build joins ISA Yachts’ Classic 65 Project Rocco which is also under construction at its Ancona facility.